Last week it was a case of The Good, The Bad and the Ugly? Well, more like The Fair, The Bad and the Brilliantly Flawed, but I needed an opening sentence, so you'll just have to live with it. The Fair refers to Slayers Try: Volume 4. After a breakneck release schedule, we've finally worked our way through the first three series of Slayers, and we can relax for a good decent while until Slayers Revolution is dubbed. Thankfully, it hasn't outstayed its welcome the way Naruto has, but I did find this third series of RPG comedy mayhem to be variable at best. Still, if the series can go out on a high note, it will serve as suitable anticipation for the next instalment. 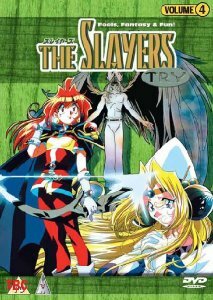 See if Slayers Try hits the high note as the fat lady sings by clicking on my review. Now The Bad, or at least I though Saiyuki Reload was bad when I watched the individual volume discs a couple of years back. Now it's Stuart McLean's turn to partake of this irreverent version of Journey to the West. Monkey, Pigsy, Sandy and Tripitaka… I mean Son Goku, Sha Gojyo, Cho Hakkai and Genjyo Sanzo travel to India to defeat the nefarious resurrected demon Gyumaoh. I had to wait a year to get all the volumes watched, Stuart gets all seven discs in the Saiyuki Reload Boxset. See if watching it all in one go results in a different opinion by clicking on his review. And then the Brilliantly Flawed… I put on my importing hat, and summoned up the Region 1 release of Ergo Proxy: The Complete Collection. Amazing animation, stunning audio, and a futuristic dystopian vision that is the staple of many a sci-fi author. What looks like a simple murder case in Romdo, the last domed refuge of humanity, leads a determined investigator to learning the truth about her world, to the forbidden land outside the dome, and to learning just what part the Proxies play in this Orwellian society. It's a brilliant, stunning piece of animation, but it does have one or two flaws. Find out what they are by clicking on my review. 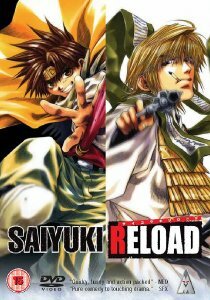 MVM release Slayers Try: Volume 4 on the 4th of January, while they also released the Saiyuki Reload boxset at the start of December. 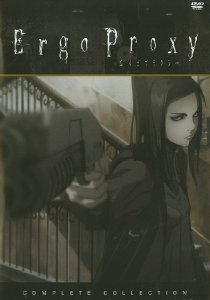 I patted myself on the back for the bargain I got with Ergo Proxy, released in the US by Funimation in September 2009, except as soon as I received it, MVM announced that they would be re-releasing their boxset at a lower price point, again on the 4th of January.